Dr. Nicole Moore specializes in Greyhounds. She is a super friend to GAGC! 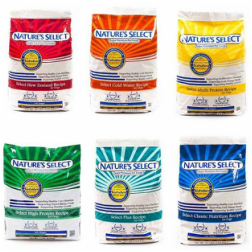 We feed all our GAGC foster dogs Nature’s Select dry food and we highly recommend it. Alan and Leslie give a donation to GAGC every time a new adopter places their first order with them. Please support us by supporting them. Mandy's Dog-O-Matic ... This is a dog wash facility that is allowing GAGC to use their equipment, shampoo, water and blowers to wash dogs coming off the track. Mandy's supports us, please in turn, support them!! Bob Fiehrer and his wife Cora are long-time GAGC supporters and have two greyhounds of their own. Featuring Greyhound Collars known as Martingale Collars or Greyhound Martingale Collars. Also Greyhound Coats and many other Greyhound Items.